Life, DLG style: Oma comes to visit! January has been a busy month at our house! I'm happy to report that even though we were out of town for New Year's, we had all our Christmas decorations put away in the first week! We had planned to go to San Antonio for some de la Garza's birthdays (brother Chris, niece Lauren and mom Jan! ), but plans changed. My Aunt Rose had a mastectomy and my mother came down to help after her surgery. This is her second fight with breast cancer, but she is doing very well and is in good spirits. She will be going up to Oklahoma to stay with my parents in a couple of weeks so she can rest more and spend time with my great-grandparents. My mom (Jon David will call her Oma) was able to spend a few days with us before flying back to Oklahoma in the middle of an ice storm! In her short time with us, Jon and I got to go on a date, we saw Body World at the museum of natural science and JD showed off his crawling skills. He hasn't "officially" crawled, but he can sure get wherever he wants to go, fast! We call it the inchworm. Life, as we've known it, has changed again! 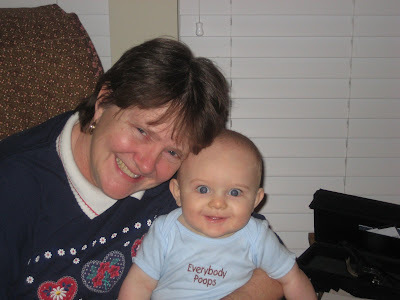 Oma's smile is as happy as John David's! She's right -- he is one cute baby. I love his bright eyes and open, happy face. What a cutie. Jennie ~ I'm so sorry to read about your aunt. She's in our prayers.